Posted Wednesday, Oct 30, 2013 12:01 AM EDT by HAMILTON SPECTATOR & filed under Cancer. Today we look at lung cancer, by far the leading cause of cancer deaths in Hamilton. 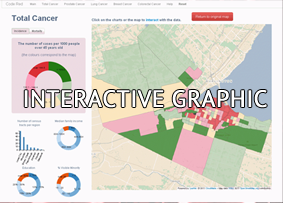 More people die from lung cancer in Hamilton than from colorectal, breast and prostate cancers combined. From 2000 to 2009, nearly 3,600 people in Hamilton were diagnosed with lung cancer and almost 3,050 people died from the disease. The rate of lung cancer deaths in the lower part of the former City of Hamilton is about 44 per cent higher than the comparable rate for the rest of Canada. The incidence of lung cancer in the lower part of the former City of Hamilton was about 80 per cent higher than it was in the five suburbs of Stoney Creek, Ancaster, Dundas, Flamborough and Glanbrook, averaged together, between 2000 and 2009. The lung cancer death rate in the lower part of the former City of Hamilton was about 85 per cent higher than in the five suburbs. Worst: The neighbourhood between Wellington Street North, the harbourfront, Sherman Avenue North and the rail line north of Barton Street had the highest rate of lung cancer incidence. Between 2000 and 2009, there were 46.7 new lung cancer cases for every 1,000 people ages 45 and older. That’s almost three times higher than the Canadian rate. 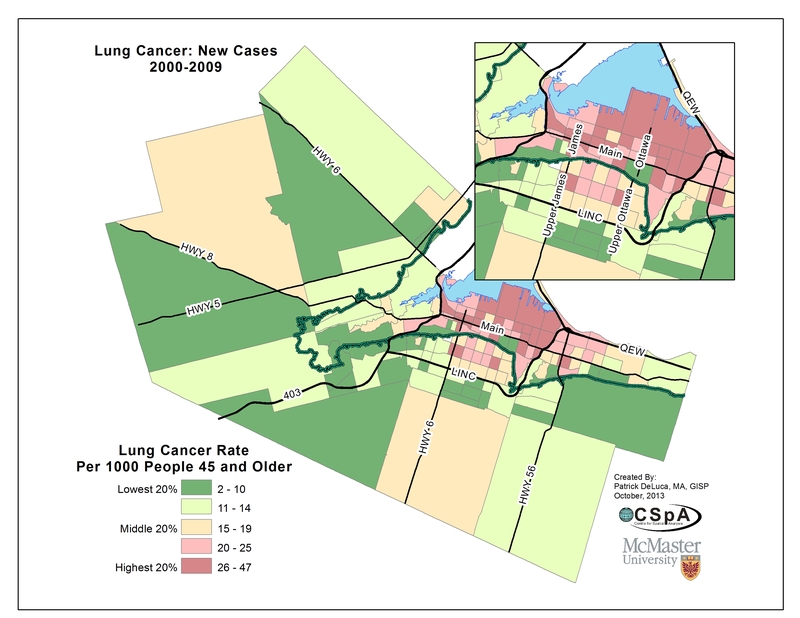 Best: The Stoney Creek neighbourhood bounded by Green Road, Highway 8, Millen Road and the escarpment had the lowest rate of incidence in Hamilton, with 2.7 new lung cancer cases for every 1,000 people ages 45 and older. Worst: The neighbourhood between Wellington Street North, the harbourfront, Sherman Avenue North and the rail line north of Barton Street had the highest rate of lung cancer mortality, with 41.7 deaths per 1,000 people ages 45 and older — also about three times higher than the Canadian rate. 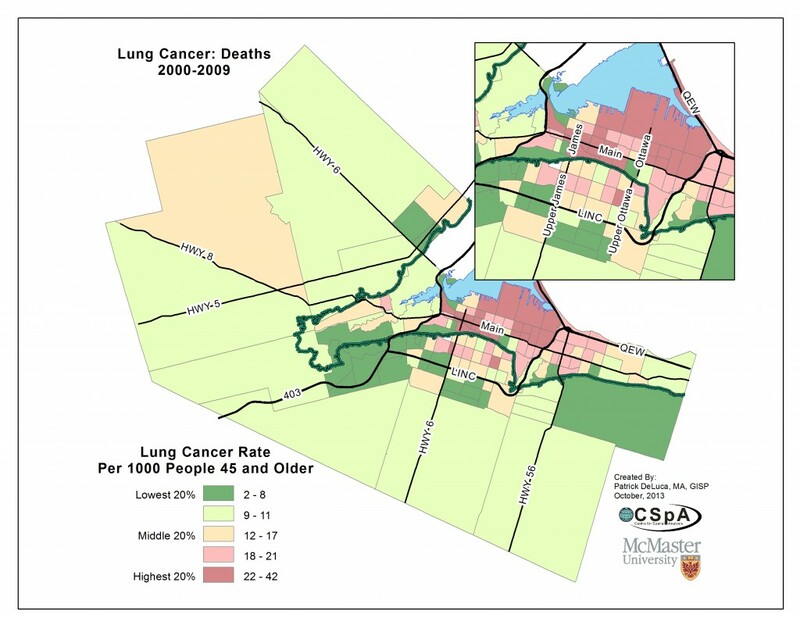 Best: The west Mountain neighbourhood bounded by Upper Paradise Road, the Lincoln Alexander Parkway, Stone Church Road West and Garth Street had the lowest rate of lung cancer deaths between 2000 and 2009 with 2.4 deaths per 1,000 people ages 45 and older. About 80 per cent of lung cancer incidence is associated with smoking. Smokers have a nine times greater chance of developing lung cancer than nonsmokers, although some studies have suggested the risk is actually 20 times greater in smokers. Regular exposure to second-hand smoke increases a person’s risk of developing cancer by 20 to 40 per cent. Exposure to asbestos fibres and silica dust can increase the risk of lung cancer by two to five times. Environment: In addition to exposure to cigarette smoke and asbestos, exposure to radon gas, which can occur in homes and buildings, increases a person’s lung cancer risk. A study led by researchers at a university in Latvia suggests that breath tests using a so-called “electronic nose” could detect the presence or absence of lung cancers in high-risk patients. The technology used in the study could distinguish with a 98 per cent success rate the differences in chemical profiles of breath expelled by patients who had lung cancer compared to those who didn’t. Most lung cancers are detected in later stages and earlier detection could lead to much-improved survival rates.